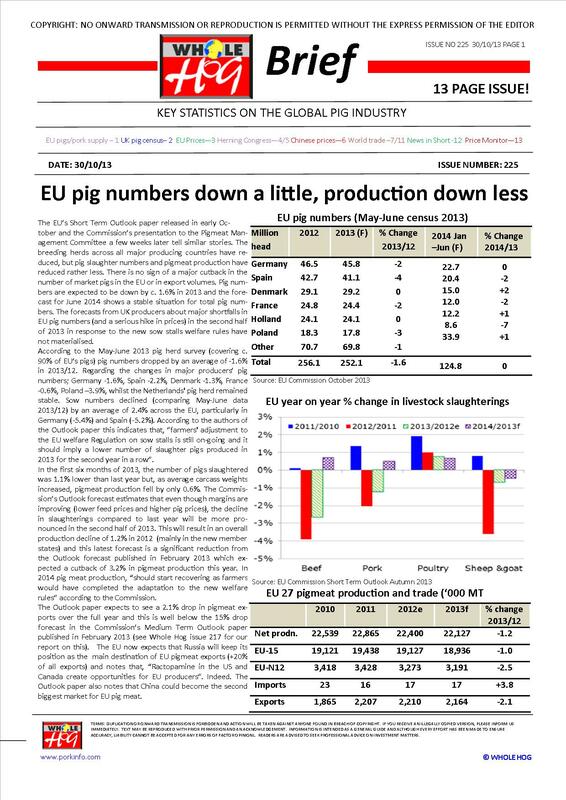 The front page of the October 2013 issue describes the latest EU pig herd census data and forecasts for production as reported to the pigmeat management committee and in the EU’s medium term outlook report. Page 2 presents data from the UK’s latest census and describes the development of producer margins and pig prices in the UK. Page 3 illustrates pig price movement in the EU in September for Euro Zone and non-Euro Zone countries. Pages 4 and 5 provide a report on October’s Herning Congress in Denmark – “more from less” was the theme. On page 6 Chinese pig prices are reported along with recent import numbers. Page 7 discusses the latest Canadian pigmeat trade data. On page 8 the USA’s pork export sales for the first eight months of 2013 are described. Australia’s exporters seem to have had a good month in August in the latest trade data on page 9. Page 10 provides the trade data for the South Korean imported pork market – another decline in sales for most exporters to that market. The Japanese market for pork is considered on page 11. News in Short on page 12 includes short reports on; a survey of pig farmers in Germany, PEDv in the USA, Danish Crown’s awards for good welfare from CIWF, ASF in Russia, the Tonnies’ joint venture in Russia, and the EU-Canada free trade deal. The back page sets out the Short View on pig prices and global pig prices for 18 countries are presented in the Global Price Monitor.